What makes a beautiful smile? The teeth, of course: bright, evenly shaped and precisely aligned with each other. But your teeth can be as perfect as can be and your smile will still appear unattractive. The reason? Your gums show more than they should when you smile. 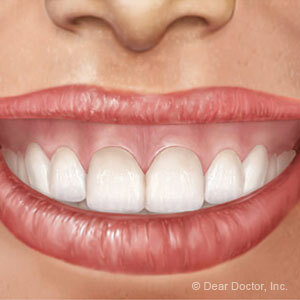 What's considered a gummy smile is largely a matter of perception that can vary from person to person. As a rule of thumb, though, we consider a smile “gummy” if four millimeters (mm) or more of the gums show. Fortunately, we can minimize the gums' prominence and make your smile more attractive. But what methods we use will depend on why your gums stand out. And it's not always because of the gums themselves. It could be your teeth didn't erupt normally during dental development. Mature crown (the visible part of the tooth) length is normally about 10 mm with a width about 75-85% of that. But an abnormal eruption could result in teeth that appear too short, which can make the gums stand out more. We can correct this with a surgical procedure called crown lengthening in which we remove excess gum tissue and, if necessary, reshape the underlying bone to expose more of the tooth crown. Another potential cause is how far your upper lip rises when you smile. Normally the lip rises only enough to reveal about 4 mm of teeth. In some cases, though, it may rise too high and show more of the gums. We can modify lip movement in a number of ways, including Botox injections to temporarily paralyze the lip. A more permanent solution is a lip stabilization procedure. It sounds bad, but it's a fairly simple procedure to surgically reposition the muscle attachments to restrict movement. Your gummy smile may also result from an upper jaw too long for your facial structure. We can correct this with orthognathic (“ortho” – straighten, “gnathos” – jaw) surgery. During the procedure the surgeon permanently positions the jaw further up in the skull; this will reduce the amount of teeth and gums displayed when you smile. Discovering the true cause of your gummy smile will determine how we treat it. After a complete oral examination, we can then discuss your options to transform your smile into a more attractive one.